It was announced today that the new production of Mary Chase’s Pulitzer Prize-winning comedy Harvey will play a limited season at London’s Theatre Royal Haymarket starting on 17th March 2015 following its tour. 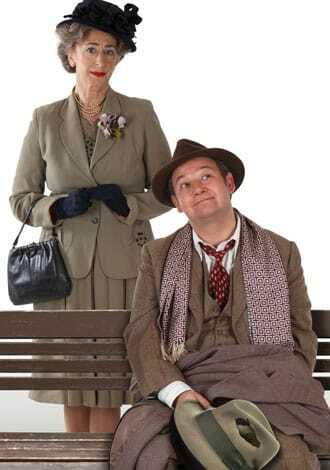 The play which stars James Dreyfus as Elwood P Dowd and Maureen Lipman as Veta Louise Simmons. Also in the cast are David Bamber as William R. Chumley, Desmond Barrit as Judge Omar Gaffney, Felicity Dean as Betty Chumley, Ingrid Oliver as Myrtle Mae Simmons, Amanda Boxer as Miss Ethel Chauvenet, Sally Scott as Nurse Ruth Kelly, Youssef Kerkour as Duane Wilson, Jack Hawkins as Lyman Sanderson and Linal Haft as E J Lofgren. Elwood P. Dowd has only one character flaw: an unwavering friendship with a six-foot tall, invisible rabbit named Harvey. In order to save the family’s reputation, Elwood’s sister Veta takes him to see psychiatrist Dr William Chumley. But when the doctor mistakenly commits anxiety-ridden Veta instead of her brother, it sets off an hilarious whirlwind of confusion and chaos as everyone tries to catch a man and his invisible rabbit. Harvey is directed by Lindsay Posner and designed by Peter Mackintosh with lighting by Howard Harrison and Sound by Paul Groothius. Harvey is produced by Don Gregory. Harvey premiered on Broadway in 1944, winning writer Mary Chase the Pulitzer Prize for Drama the following year. The production was directed by Antoinette Perry, after whom the Tony Awards are named. The play premiered in London in 1949 at the Prince of Wales Theatre. In 1950, Mary Chase adapted her play for the big screen, with James Stewart in the role of Elwood P. Dowd. James Stewart went on to star in the Broadway and London revivals of the stage play – in 1970 with Helen Hayes on Broadway and in 1975 with Mona Washbourne at the Prince of Wales Theatre.